AnyVan has teamed up with Lynne Lambourne of Love Nellie to bring you a new Ultimate Upcycling Trilogy with perfectly easy ‘how-to’ transformation guides. 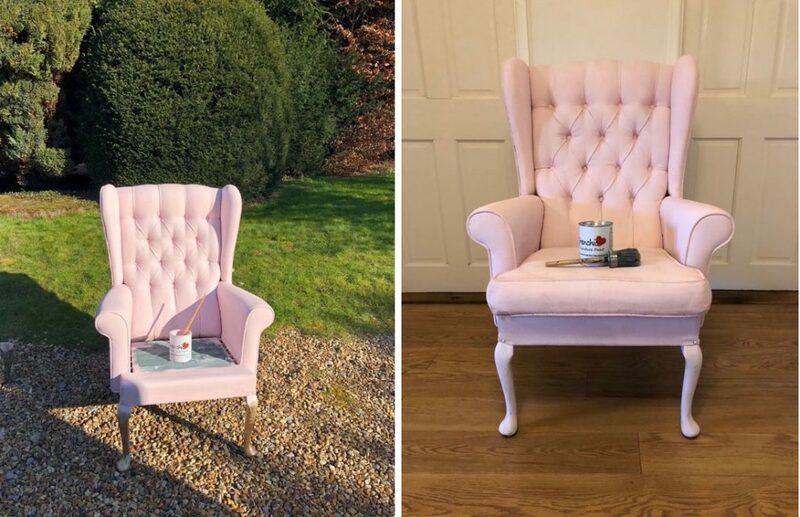 We are excited to bring you the first instalment from our trilogy which offers a step-by-step guide for Upcycling an old, unloved fabric armchair using chalk paint. Painting a fabric chair using chalk paint sounds like a complicated task, but Lynne Lambourne of Love Nellie is here to inspire you to get creative and talk you through the whole process. Good quality paintbrushes in various sizes to get into all the nooks and crannies. Painting fabric with chalk paint is a technique that even the most passionate of upcyclers seem to have little or no knowledge of and usually when I mention to people that it is easy to transform a fabric chair using chalk paint I am met with a bemused look. But the good news is, yes, you really can! It’s super easy and can save you tons money as reupholstering chairs can be very expensive. 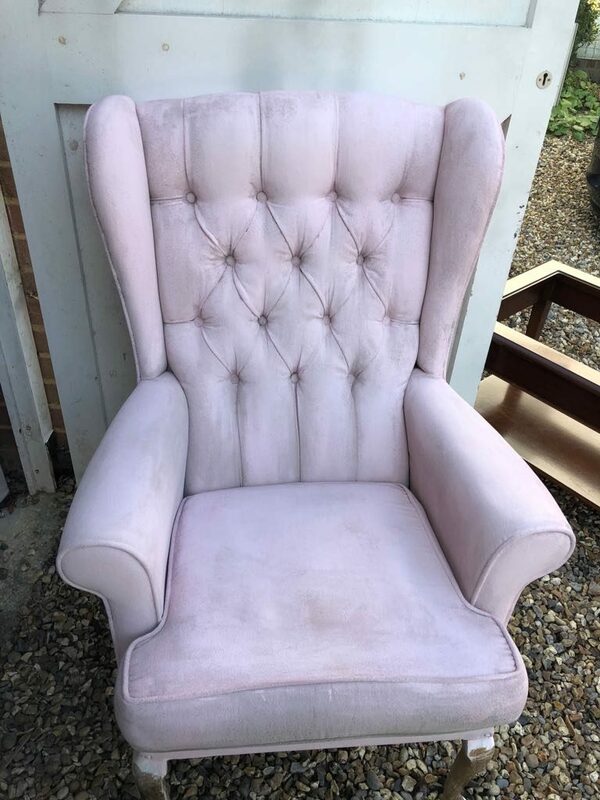 I recently found an old chair that had amazing style and shape, but the colour of the fabric was really not what I wanted. 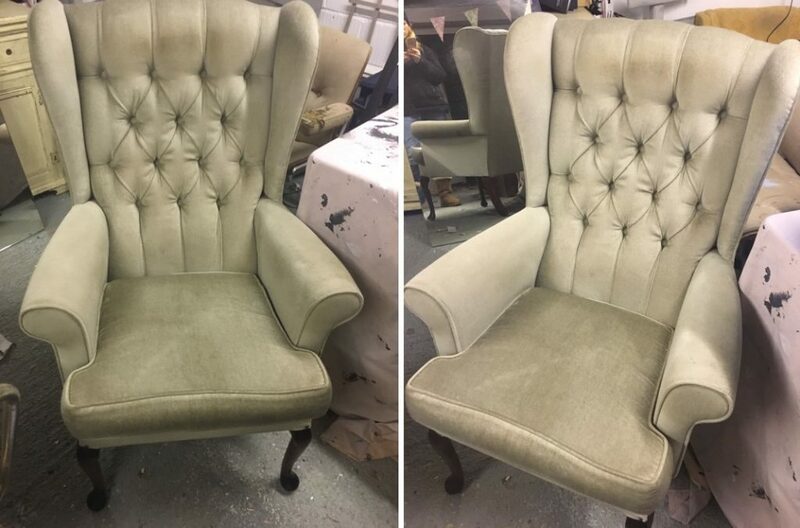 Second-hand sites like Preloved are overflowing with unloved chairs like the one used in this upcycling project, and often it is the out-of-date fabric which deters us from buying such lovely items. 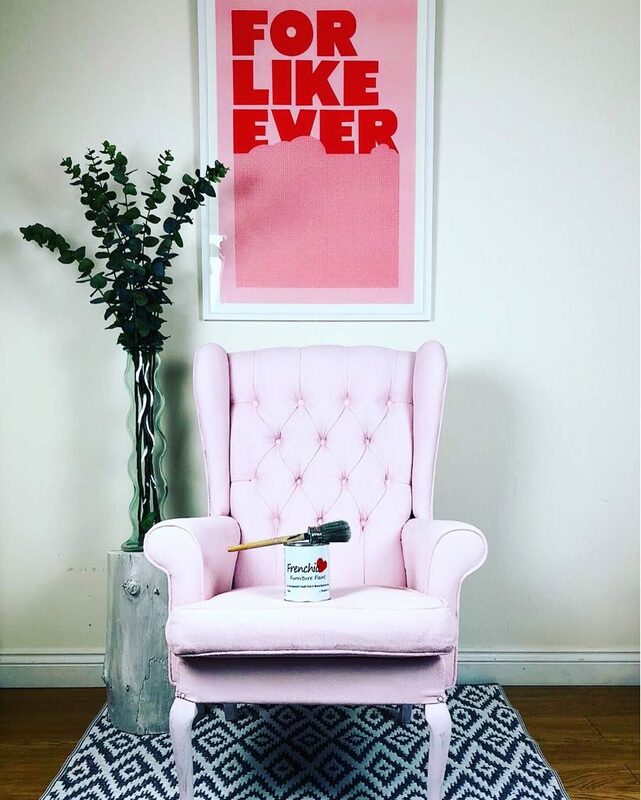 I knew that I wanted a chair that was pink, so I decided that it was up to me to transform it into the exact chair that I wanted with the help of some fabulous chalk paint! I gave the chair a good vacuum to get rid of any cobwebs and dust, you don’t want them getting onto your paintbrush or sticking to the fabric and forming clumps. Tip: I always start painting a chair upside down so that I can paint all the hard to see areas first, otherwise I might miss them! You don’t want to turn it upside down and rest the chair on areas that have already been painted as you could lean in on bits you have already painted and spoil it. When painting fabric, lots of blogs will tell you to get a water spray can and spray the fabric before you paint it. I find that dipping my brush in water and then into the paint worked just as well. Of course, the fabric is absorbent, so it will use a lot more paint than normal, so be prepared! I found that due to the particular fabric of my chair (velvet) painting in circular motions worked best but if you have a smoother material then just painting as if it was wood will work fine. The chair had a button-back style which was a lot trickier to work with as I had to use a smaller brush to get into the folds and dips where the buttons were sitting. I chose to use Frenchic pink paint in Ballerina and the coverage was good considering I was painting over a much darker green fabric. The first coat left a slightly patchy outcome on the chair. I had to let it dry completely as it’s important to sand in-between coats of paint with a 220 grit sandpaper (or higher). This softens the fabric and removes any resulting stiffness. I also found that it managed to blend the paint slightly and ease the patchiness – double result! The legs of the chair were a dark wood colour and I wanted to do something a little bit more creative with them so I painted them white. Once that had dried I then used Rustoleum metallic gold paint to add a bit of detail so that when I painted the third layer of paint in pink and sanded it back, the layers would be revealed and it would give it an aged look and a bit of sparkle. Once the second coat was added and dried in the winter sunshine, there wasn’t a trace of the original colour and it was transformed – just like magic! The paint on the back enhanced the button detail and almost gave it a ‘work-of-art’ look. The paint added definition as well as style. Once the topcoat had dried, it was time to seal the chair with wax. I used Fenchic clear wax and gently rubbed it into the paintwork. This protects and seals the paint and transforms the chair’s texture into something similar to leather. This means that if you sit on the chair the paint won’t come off on your clothes, making it much more durable. For a day’s work and a couple of cans of paint, you can completely transform a chair and make it fit into your interior perfectly. So, if you fancy a stylish new chair, don’t wait around for the perfect one, make the perfect one yourself! If you need a helping hand getting your newly upcycled projects or materials back home, get in touch with AnyVan today for a free quote! We move anything, anywhere.